Initial reference count is zero. Definition at line 25 of file ReferenceCounted.cc. Definition at line 29 of file ReferenceCounted.cc. std::out_of_range if reference count is not zero. Definition at line 33 of file ReferenceCounted.cc. Definition at line 57 of file ReferenceCounted.h. Definition at line 62 of file ReferenceCounted.h. Definition at line 66 of file ReferenceCounted.h. Deletes the object if reference count gets zero. std::out_of_range if reference count is zero. Definition at line 73 of file ReferenceCounted.h. Called by zypp::intrusive_ptr to add a reference. Definition at line 86 of file ReferenceCounted.h. Definition at line 92 of file ReferenceCounted.h. Overload to realize std::ostream & operator<<. 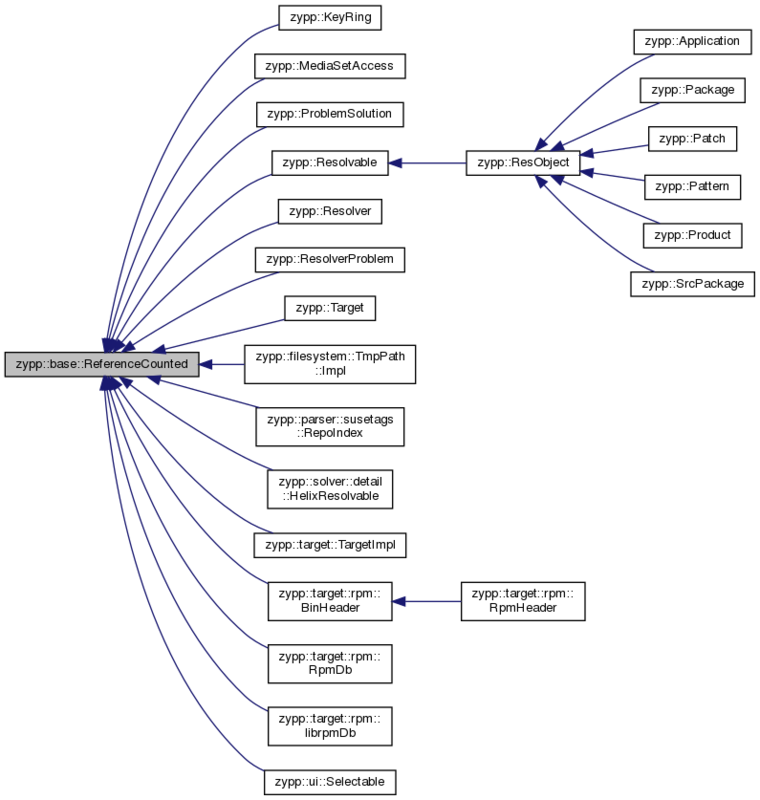 Reimplemented in zypp::target::rpm::RpmDb, zypp::MediaSetAccess, zypp::media::MediaAccess, zypp::target::rpm::librpmDb, zypp::Target, zypp::target::rpm::RpmHeader, zypp::target::TargetImpl, zypp::target::rpm::BinHeader, zypp::ResObject, zypp::Resolvable, and zypp::parser::susetags::RepoIndex. Definition at line 47 of file ReferenceCounted.cc. Trigger derived classes after refCount was increased. Definition at line 100 of file ReferenceCounted.h. Trigger derived classes after refCount was decreased. No trigger is sent, if refCount got zero (i.e. the object is deleted). Definition at line 106 of file ReferenceCounted.h. Definition at line 41 of file ReferenceCounted.cc. Definition at line 118 of file ReferenceCounted.h. Definition at line 122 of file ReferenceCounted.h. Definition at line 126 of file ReferenceCounted.h.